I was young and foolish with a crush. I didn’t know that the one night I decided to take things into my own hands, would change the course of my life forever. I knew what I wanted, I wanted Alex, but somehow, I ended up with Victor’s attention instead. Little did I know I would fall in love with them both. Things weren’t as simple as they seemed anymore. My series of poor choices led me into Victor’s arms and that was where thought I planned to stay. I had to make a final choice, and I did. However, the Universe stepped in to make my ultimate choice for me. They say you only live once, but does that mean you have to love the same way? *This is Book 1 in the Destiny series from the bestselling, award-winning author Blue Saffire. This Book is from the Evei Collection. 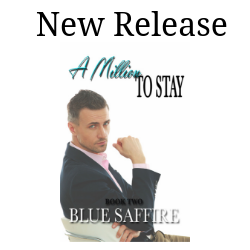 They are not connected to the other Blue Saffire books outside of the collection. This book was once released as Destiny by Evei Lattimore as a sweet novel. This is a re-release with revisions and the signature Blue Safire heat.